EDITOR'S NOTE: This story is no longer being updated. Please see the latest updates on the Metro closure here. Hundreds of thousands of commuters, visitors and residents of Washington, D.C., are searching for travel alternatives Wednesday after the entire D.C. Metrorail system was shutdown for an emergency safety inspection. Metro General Manager Paul Wiedefeld took the unprecedented step of shutting down the entire system at midnight and keeping it closed until 5 a.m. Thursday so crews could check about 600 underground jumper cables. Riders are scrambling to make other plans after they learned late Tuesday afternoon that Metrorail would shut down entirely on Wednesday for emergency safety inspections. 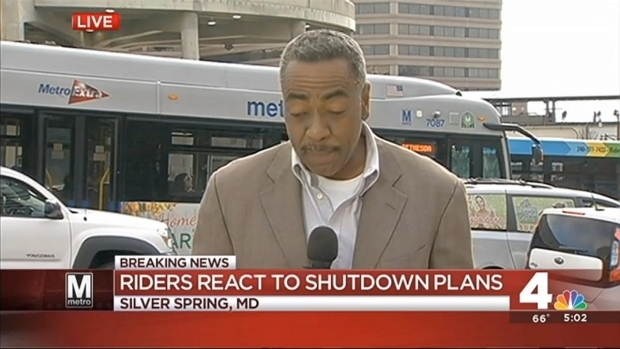 News4's Wendy Rieger, Mark Segraves and Shomari Stone report. A problem with those cables caused a fire at the McPherson Square station early Monday, according to a preliminary investigation. The same problem also led to a smoke incident at L'Enfant Plaza in January, 2015, that killed one person and injured others. "While the investigation (into the McPherson Square incident) is ongoing, the preliminary findings show commonalities with the cable fire in L'Enfant Plaza a year ago," Wiedefeld said. "While the risk to public is very low, I cannot rule out a potential life safety issue here," he said. "This is why we must take this [step] immediately. When I say safety is our highest priority, I mean it." Metrorail has never shut down, except for weather-related causes, since beginning to operate in 1976, Metro Board Chairman Jack Evans said. Federal employees have the option to work from home or take unscheduled leave, the U.S. Office of Personnel Management announced about 6 p.m. Tuesday. D.C. public schools will be open Wednesday, the school system announced Tuesday evening. DCPS is working with Metro to add bus service. Absences and tardiness will be excused, DCPS said in a tweet. 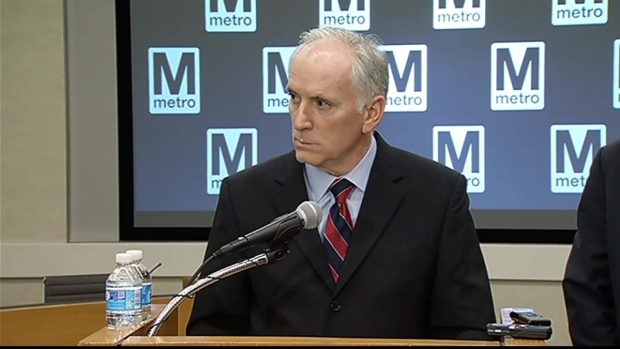 Metro General Manager and CEO Paul Wiedefeld and Metro Board Chairman Jack Evans announce the shutdown of the Metrorail system all day Wednesday for a safety inspection of equipment. Wiedefeld said he chose to have crews inspect the entire system all at once rather than to spread out the work over a longer period of time. "If we do it piecemeal, this could take weeks," he said. The Metro boss said he thinks the work will be complete by the time Metrorail is set to open at 5 a.m. Thursday. 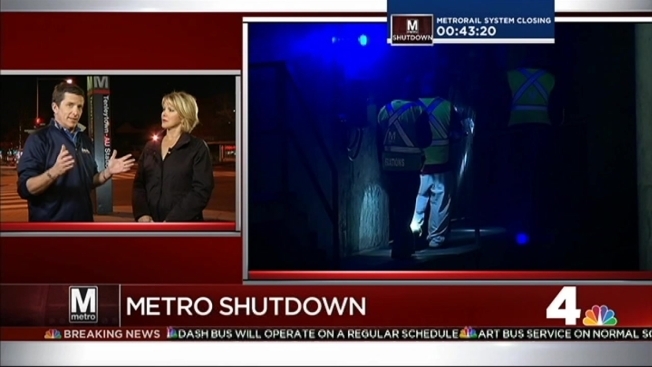 News4 has team coverage on Metro's decision to shut down the rail system Wednesday for a safety inspection after a cable fire Monday. Mark Segraves, Derrick Ward and Scott MacFarlane report. "We feel that we can do it in that time period," Wiedefeld said. The closure of Metrorail, which transports about 730,000 people on an average weekday and is the backbone of commuting throughout the nation's capital and the region, will disrupt the daily routines of hundreds of thousands of workers. D.C. Streetcar was among the other transit agencies that responded, reminding commuters that there are some other options. Still, traffic on area roads on Wednesday morning could be extremely heavy. Parking in all Metro garages will be free Wednesday for customers taking buses or carpooling, Metro announced. The DC Taxicab Commission will allow multiple passengers to be picked up together and dropped off at different locations without any additional surcharges. Transportation officals say restrictions for HOV and Express Lanes on area highways will remain in place Wednesday. 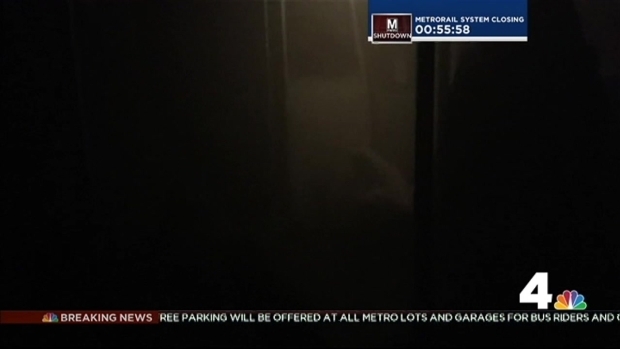 One Metro rider died and dozens were hurt Jan. 12, 2015 after a Metro train filled with smoke near the L'Enfant Plaza station. Carol Inman Glover, 61, of Alexandria, Virginia, was a beloved mother and grandmother who had just won her company's employee of the year award.